Interior designers at Viridis Design Studio have broad design experience creating new restaurant spaces and remodeling existing restaurants. Restaurant interior design is often at the forefront of interior design trends and as delectable as the cuisine served inside. Correspondingly, an exquisitely designed restaurant will complement the menu and the conversations of guests rather than distract from them. All elements of restaurant design aim to maximize profitability by providing an experience to diners that stretches beyond great food and brings them back repeatedly. Denver’s own designers from Viridis Design Studio carefully curate memorable atmospheres for restaurant interiors. Our professional commercial designers begin each project with patronage and profitability at the start of every design. Naturally, in this competitive industry restaurants can create an alluring hook by offering an environment that delights guests and sets them apart from competitors. However, all design elements must synchronize to deliver a functionally and visually fascinating flow for the dining experience that ultimately positively impacts the bottom line. The most strategic and successful restaurant owners we’ve worked with included interior design consultation at the beginning of a project since making a design vision a reality requires ongoing collaboration. Additionally, many costly mistakes can be avoided by bringing in an interior designer in during the first stages of a project. 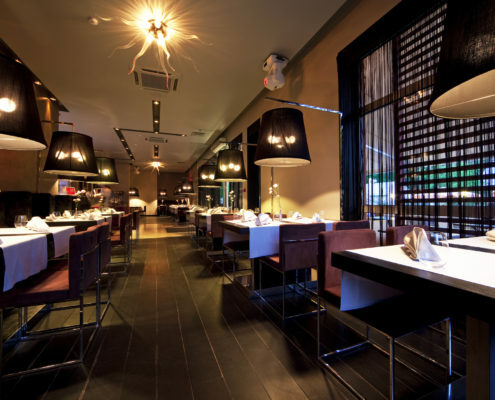 Read more about how restaurant atmosphere impacts profitability. To discuss your restaurant interior design with a professional commercial designer in Denver, CO, please call or email Viridis Design Studio today at (303) 489-9958 or fill out our online contact form.